The bees are facing major problems worldwide at the moment while you are using them for ‘art’ whilst ‘hopefully not killing the growing larvae’. It seems to me that rather than just focusing on Can I Do It, it may be worth also considering, Should I Do It? Adele lighten up, at least he’s giving them a home and looking after them which is more than most of the people who moan about bees disappearing do. He’s not harming the bees so tell me why are you so indignant about what he’s doing? I suggest that if you’re so concerned about the plight of the bees you acquire some for yourself and treat them as you want. Great blog! I recently read about a very old technique called “glass jar beekeeping” that you may find helpful. Its a technique for doing comb honey that was used prior to the development of moveable frame hives. 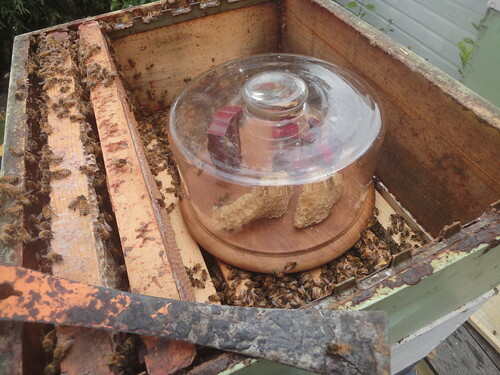 They simply drilled holes in the lid of the hive and inverted glass jars that had strips of wax attached to the bottom of the jar. A box is then placed over the jars to give the bees some privacy and they will draw some interesting comb in the jars and fill them with honey. 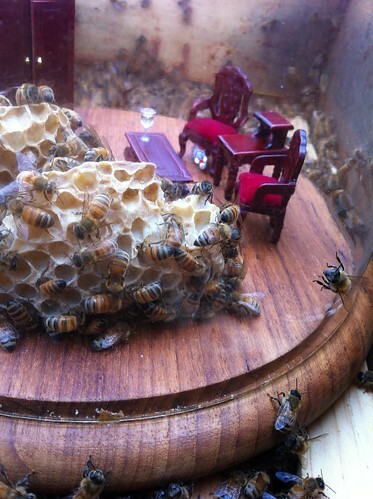 It takes advantage of the fact that bees like to start at the ceiling and work down. 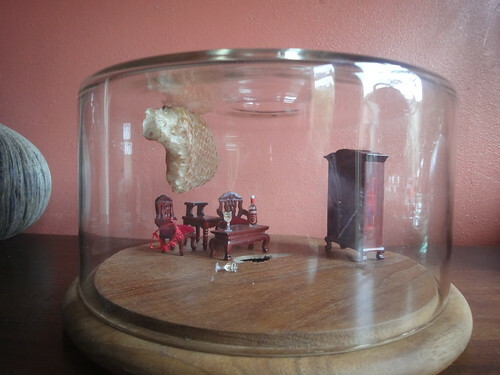 You could do something similar by simply gluing the furniture in place, attaching some strips of wax to the wooden floor as starter strips and then inverting the whole jar over a hole in the lid of your top bar hive. One other caveat is that like most comb honey techniques it requires that you limit the bees options as far as other places to store honey. 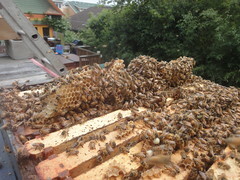 Supposedly the bees have to be a bit crowded for this to work well. In traditional glass jar beekeeping they would fill the jars with liquid honey after they had harvested them. This is fascinating. I look forward to seeing more of your work. Seriously, Adele? You are worried that this man is going to cause colony collapse by doing this? You don’t think this might actually help increase awareness of bee keeping, of how fascinating bees might be, of their plight even? I sure hope you are putting the rest of the your time and effort into some serious protesting and action for the massive amount of actual harm going on out there in the world. Go heckle some factory farms. Go tackle some greedy ag corporations. Go petition for Fair Trade.